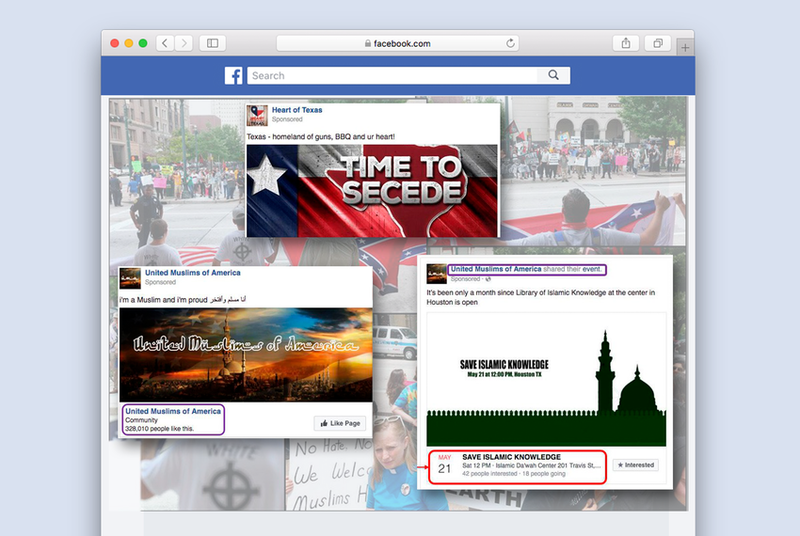 The Russian-based Internet Research Agency used two social media accounts in particular – "Heart of Texas" on Facebook and @rebeltexas on Instagram – to spread falsehoods and exert divisions during the 2016 elections, according to a new report. In at least one case, Heart of Texas’ vitriolic posts resulted in dueling protests outside a Houston mosque during the 2016 election cycle. As the page announced a rally on May 21, 2016 outside the Islamic Da'wah Center to “Stop Islamification of Texas,” a separate Russian-sponsored group, United Muslims of America, advertised a “Save Islamic Knowledge” rally for the same place and time. Interactions between the two groups eventually escalated into confrontation and verbal attacks. That Russian groups were behind both protests came to light in late 2017, when federal lawmakers released a cache of information about the extent Russian operatives made use of Facebook during the 2016 presidential campaign. On the @rebeltexas Instagram, according to the New Knowledge report, the IRA manipulated political events such as Brexit to promote armed insurrection and Texas secession, which has a long history in the Lone Star State. Social media accounts focused on Texas secession also pushed for a real-life #Texit rally, though it did not include specifics, the New Knowledge report said. Heart of Texas posts also emphasized voter fraud as a major problem in the state, claimed that “illegals” were overrepresented in the state’s voter rolls and that the Democratic Party was assisting these undocumented immigrants to vote multiple times. Altogether, the report found 109 posts — across IRA social media accounts — focused on “amplifying fears of voter fraud,” most of them targeting right-wing audiences.